Ranikhet meaning Queen's farm, is a hill station developed by the Britishers around ancient temples, undulating Himalayan hills and forests. Ranikhet with its cool climate and simple natural beauty can freshen up your senses to the very core. It is also popular as the Headquarters of the Kumaon Regiment of the Indian Army and has the Kumaon Regimental Centre Museum. The museum has a splendid display of weapons, photo etc. to introduce you the grandness and significance of military and its various historical instances. 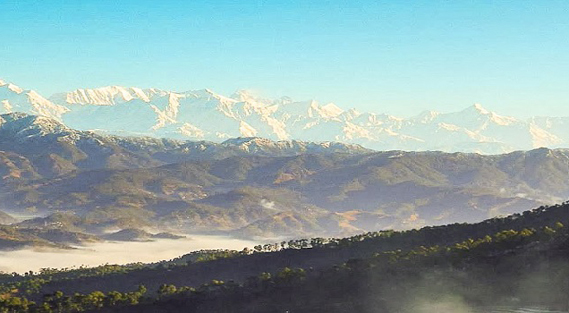 Ranikhet is popular for its views of the Nanda Devi Peak, trekking ranges, mountainous climbs, golf courses, orchards and temples.